The beer is flowing in the capitol city. With new laws in WV allowing growlers to be purchased at Charleston establishments and bars, the craft beer craze is even stronger in the Mountain State. A micro-brewery attached to Black Sheep Burritos in the heart of downtown Charleston. Fine craft beers of all styles brewed and served on-site. Located at the Capitol Market, the shop features a huge selection of wine, cheese, craft beer, gift items, accessories, and glassware. Pies & Pints restaurant in Charleston West Virginia serves unique, delicious gourmet pizza and craft beer in the center of the city’s downtown shopping district. If you’re looking for something different, Bricks and Barrels is a great option! Sit in one of the Barrel shaped booths and enjoy their large variety of beers and wines and food from their eclectic menu. Copper Pint Pub is an Irish Pub with a large selection of local and imported craft beers. Also carry a huge selection of Irish Whiskeys, Bourbons and Scotches to satisfy the most diverse taste buds. The Charleston area’s original beer tasting event. 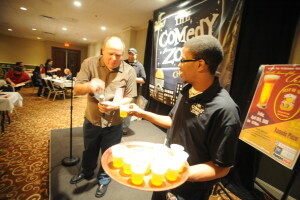 Held at the Comedy Zone, participants sample 10-12 beers along with food pairings. Entertainment provided by the Comedy Zone. Some wine offerings are available in place of beer for those who want to try something different. Part of FestivAll, Charleston’s Fund for the Arts produces this day long concert and lawn party. Beer and BBQ vendors provide suds and great food while blues musicians take the stage and attendees enjoy the lawn of the University of Charleston.